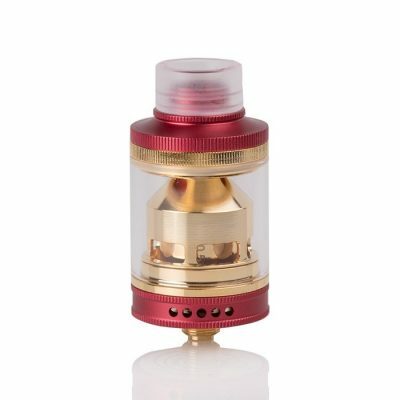 We just received the gold-plated Wake Tank for review, and you can color us intrigued. On the surface, this gold-enhanced beauty appears to be nothing more than “another” sub-ohm tank designed to balance flavor and vapor production. 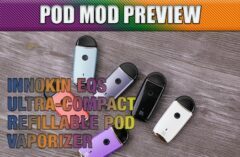 But the real intrigue comes from its manufacturer – Wake was the original parent of Dotmod, which has made some serious vaping products these past few years. 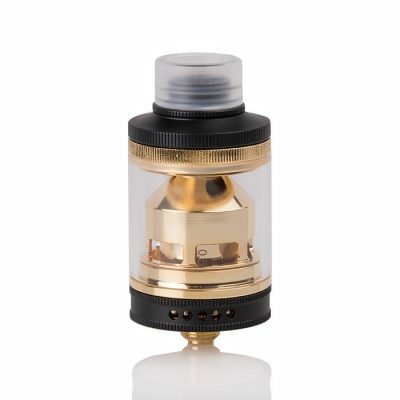 The first thing anyone will notice about the gold-plated Wake Tank is just how much gold there is. Normally, tanks limit the gold plating to contacts, to improve conductivity and reliable power delivery. 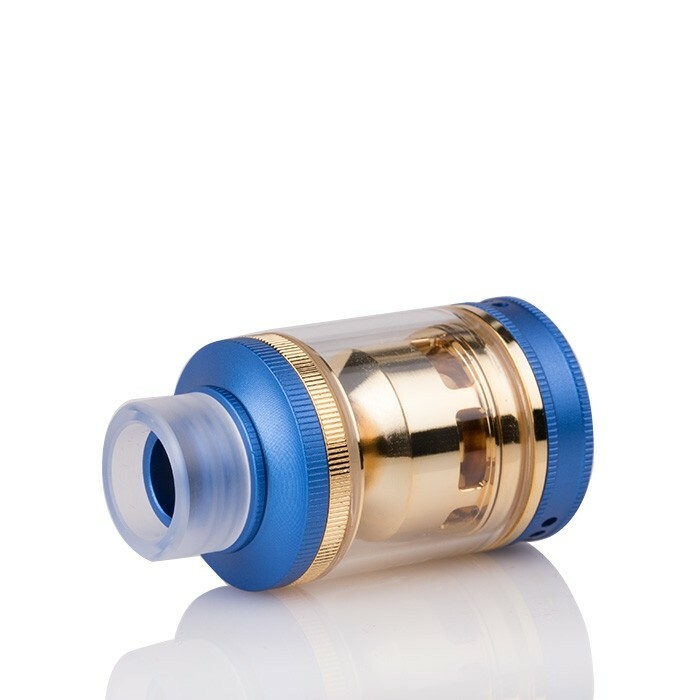 But the 24mm Wake Tank extends the gold to all internal parts. 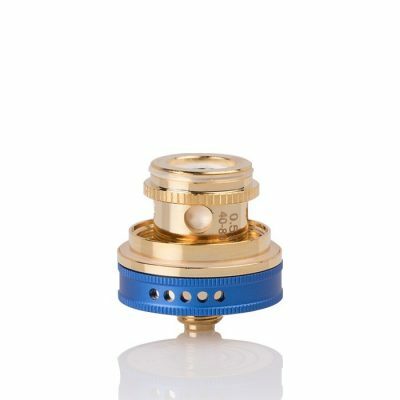 In fact, other than the anodized aluminum top cap and airflow control ring, there’s gold covering everything else, right down to the pair of 0.5-ohm coil heads included in the box. Heck, even the packaging screams high-class vaping – the Wake Tank box resembles the presentation of a nice piece of gold jewelry or higher-end watch. 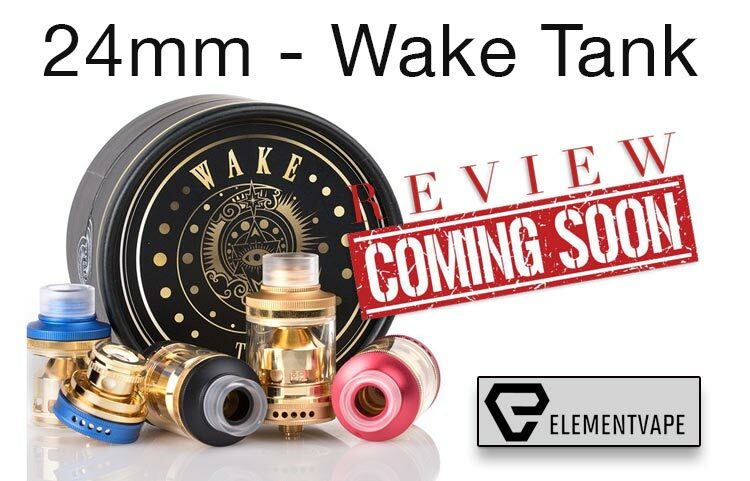 Though we didn’t get one for review, Wake will also be releasing a dual-purpose RBA package that includes a pretty expansive build deck that maximizes the space provided for some creative coil art. Even with a 24mm width, some YouTube videos are showing how easy and versatile this deck can be. As a self-proclaimed RBA enthusiast, this is always good news for me. We’ll try to get a hold of one before the review drops next week. The coils themselves are works of art, with the exception of of the wicking, which was oddly sloppy on both of our test heads. We noticed cotton fraying and “peeking out” from the wide coil chamber. Though our initial testing didn’t seem to suffer because of this, I do worry about the longevity of the coils with heavy use, due to uneven liquid flow. 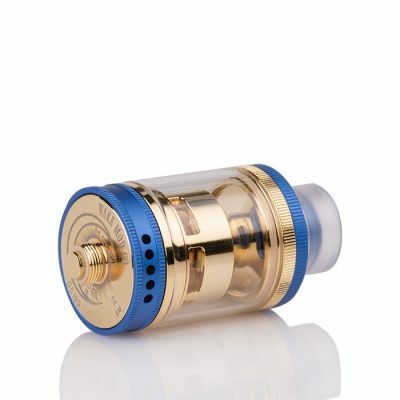 However, the rest of the gold-plated Wake Tank coil heads are extremely encouraging. Wide juice ports and fantastic threading allow the coils to work great, once they break in. Our early testing showed that the coils need to go through about a tank of high-VG e-liquid before really hitting their stride. While coil break-in is nothing new in sub-ohm vaping, we seemed to notice it more here. When competing tanks are making coils that offer prime flavor and vapor right from the outset, first impressions of the Wake Tank might be underwhelming. For those who stick with them through the break-in time, the Wake Tank coils offer some of the purest flavor around. These 0.5-ohm heads aren’t designed for massive clouds – just rich, nuanced flavor. Don’t get me wrong, they offer thick, satisfying vapor. 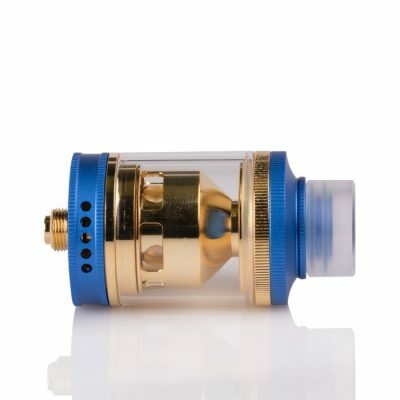 But buying the Wake tank for clouds alone is missing the point. Is the flavor just as golden? This is a tank that should make you want to break out some old juices and see if they taste better. In our short time with the Wake Tank, we’ve been really impressed by the way it makes our favorite e-liquids taste even better. On our first coil, we used Mr. Macaron Lemon Cake – one of our preferred juices around Spinfuel headquarters. Though we’ve enjoyed this liquid in every possible type of atomizer, we were floored by how much crisper the lemon notes were in the Wake Tank. In turn, the decadent cake undertones were more enhanced on the exhale, causing us to fall in love with the juice all over again. On our second coil, we used a thinner, higher-nic juice, and tried the Wake as a restricted lung hit atomizer – a role in which it shined. In fact, after less than a few hours with the Wake Tank, I’ve already determined that this flavor-first device is best used in this manner. 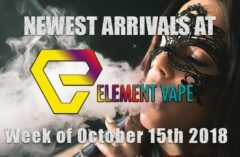 The juice we tried – an old 50/50 blend, Vape Wild mint gum juice – wicked perfectly, and offered some serious flavor and throat hit through the Wake Tank’s proprietary drip-tip. The short, stocky tank design means the chimney is short, as well. This delivers near-instant hits of warm, unadulterated flavor. The five-step airflow control only loosens the snug draw a bit. Even wide open, the draw is still a touch restrictive. 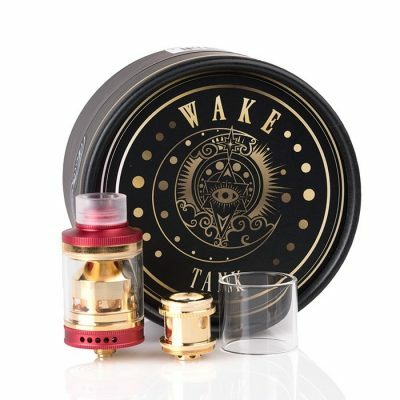 Though it can certainly be put to use in this capacity, the Wake isn’t aiming to unseat your favorite RDAs and tanks. Instead, this seems to be the tank that wants to be something for everyone – maybe the only tank you need to take on a road trip. In my short time with this flavor-focused atomizer, I found the best balance of flavor to come in a lower-wattage, restricted lung setup, where the already warm vapor wasn’t too powerful or overwhelming. We’re going to be trying more juices and watching the longevity of these coil heads more closely over the next few days. Once we think we have a handle on how the Wake holds up to our rigorous testing, we’ll be sure to report back soon. We’ll also try to get a hold of the RBA deck to see if the Wake can hang as a rebuildable device. Based on our early experience with the prebuilt coils, the gold-plated Wake Tank could make some waves when it hits stores this year. Look for the full review in the next week or so!